There was a nunnery on the site of the farm which was first mentioned in 1120. St Giles in the wood nunnery served the community for 250 years until it was demolished by King Henry VIII at the time of the nationwide dissolution of the monasteries. The King then exchanged Beechwood for land owned by Sir Richard Page in West Molesey, Surrey. King Edward VI who was a very sickly person occasionally used Beechwood as a Royal Resident believing that the air on the estate was particularly good for his health. The estate as you see it today is much as it was when the Sebright family purchased it in 1693. The large house was built in the reign of Queen Anne close to the site of the nunnery. Over the years it was enlarged and improved by successive generations of the Sebright family and the house and the estate remained under Sebright ownership until the outbreak of the Second World War. In 1961 the house was sold and a boy’s school was established there, and continues to this day to be a very successful and popular seat of learning. The home farm together with its shooting rights and extensive woodland was, and still is, one of the most impressive farms in the area. Today many of the farms original buildings remain, including the piggeries, the blacksmith and carpenters shops and enclosed stock yards. In 1964 the estate, minus Beechwood House was purchased by the Logan family who moved there from Ayrshire in Scotland. The farm remained in the Logan ownership until 1982 when it was purchased by Mr Robert Blake, a local farmer. 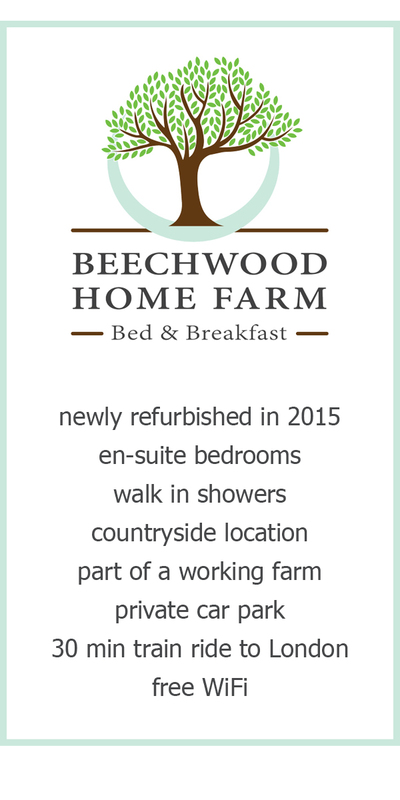 Mrs Barbara Blake, her daughter Julie Shaw and her family continue to live at Beechwood and it is they who will be offering you a very comfortable and friendly accommodation set amidst beautiful woodlands.